Succeeding as an independent artist or maker requires more than stunning design and fine craftmanship. Paradise City helps you reach sophisticated customers and collectors. 1. You’ll find yourself in great company. The artists accepted to Paradise City are among America’s most creative and technically skilled in contemporary craft and fine art. 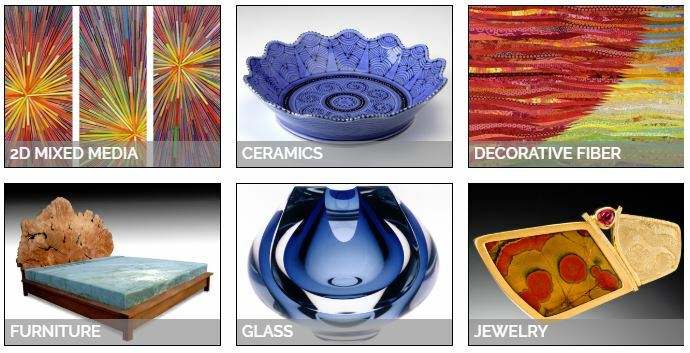 We consciously include a wide diversity of styles, media, and price ranges to appeal to a broad range of collectors. See the Artist Showcase for a list of exhibitors curated into Paradise City over the last year. Its like being at a museum except you get to take art home! Paradise City customers show up with intent to purchase. They tend to be well educated, affluent, often homeowners, and enthusiastic buyers of contemporary craft and fine art. 80% reside in the core market area of New England and 20% are from New York, the mid-Atlantic states, and beyond. Many customers come back year after year because they know they will be inspired by the variety, quality, and artistry at the show. Paradise City artists report strong sales across all types of media and all price ranges. Sales frequently top $25,000 and average sales are between $7,000 and $8,000. 3. You’ll connect with galleries, museums, shops, corporate buyers, and decorators. We offer hundreds of VIP passes to gallery directors, museum curators, corporate buyers, and professional decorators and designers who are on the lookout for new and innovative work. As an exhibitor, you will have the opportunity to forge relationships that will benefit you long after the show is over. 4. We do your marketing for you. Paradise City uses digital and traditional marketing strategies to increase your visibility and sales to over 200,000 highly qualified customer prospects. From email, social media, and content marketing to traditional advertising, PR, and direct mail, Paradise City initiatives drive high awareness of our shows and attendees right to your booth. The Paradise City Guide is mailed to over 60,000 homes of collectors throughout the Northeast to promote the quality and diversity of our unique exhibitors. Our unique Artist Membership program provides marketing services that include customized email promotion, personalized direct mail, digital marketing, and free personal web pages. Being successful in this business is such a balancing act. You have to make work that people want to buy, but it’s so much more than that. A personal relationship with the customers, and being present and available at the craft shows is so hugely important. Paradise City has created the perfect environment to bring the craftspeople, their work, and the people who love it all together, and I appreciate that so much. 5. We’re easy to do business with and artist-friendly. Paradise City is run by artists for artists. We make setup day as painless as possible, including easy setup and load out, access to staff, and a well-stocked hospitality table of refreshments. On the business side, we ease your administrative burden from the time of application to the day of the show. 6. You can apply online in minutes. Applications for our Fall 2019 shows are open and the deadline is April 3, 2019. We make it easy as pie to APPLY ONLINE. We can jury your work from your website or other image location and look carefully at every artist and every application. You’ll know by May if you are accepted for a Fall 2019 show. Please join us and apply now!